HOLIDAY SPECIAL! Book during Dec 20th through Jan 4th and Receive a FREE MID STAY CLEANING along with FREE CLOSING CLEANING. 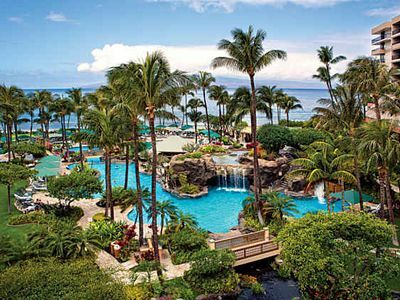 Set along the West Maui Coastline, Just South of Kapalua and midway between Napili and Old Town Lahaina, Kaanapali Royal Resort is centrally located in the very popular Kaanapali Resort Area. 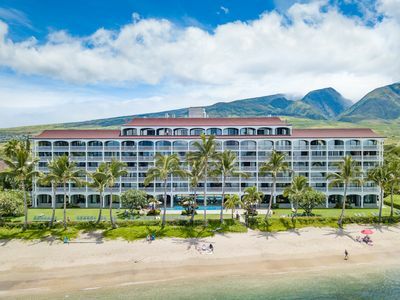 Offering unparalleled landscape and stunning ocean views, Kaanapali Royal Resort is the ideal resort for romantic getaways or family vacations where guests stay anywhere from five nights to months at a time. 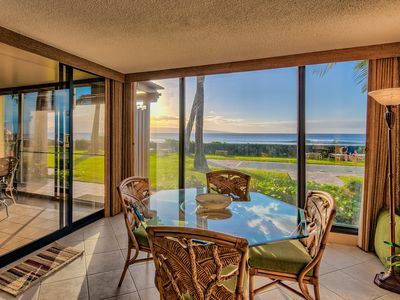 With our spacious 2 bedroom suites featuring all of the amenities of a home, dining on your own private lanai, a safe walking distance to the beach with an array of activities, guests will experience the very best of the West Maui Coast and the island of Maui. 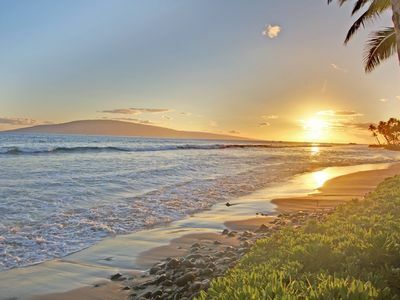 We invite you to escape the ordinary at our Kaanapali Royal Vacation destination. 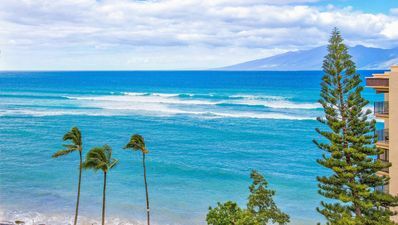 Ka'anapali Resort Area offers the most predictable weather, along with being surrounded by beautiful grounds, two golf course, and open relaxed walk-ways make walking the area desirable. Take a quick stroll (5 min) to Whalers Village, enjoy shopping & dinning. Just past the Village offers a 3 mile sandy beach, with sunsets you don't want to miss. Looking for a shorter walk, stroll over to The Fairway shops (2 min) for morning coffee, exercise, massage, hair, nails, island excursions, groceries, shop, dine or for those that want to settle in pick up some take out. Whether you are looking for a relaxing or an action packed vacation, the Ka'anapali Royal is the right place to be. It is a quiet, safe resort that sits just behind the busy Whalers Village and the Ka'anapli Beach Resorts. 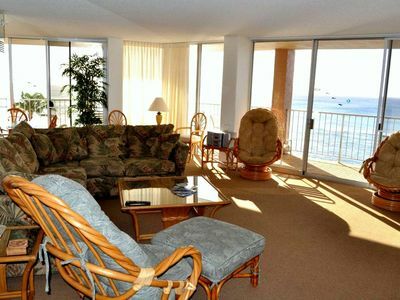 Our Remodeled, Air-conditioned, 1800 square feet condo is located on the top (3rd) floor which gives you the ability to have a gorgeous view of the ocean. It comes fully equipped with every thing you need to relax. 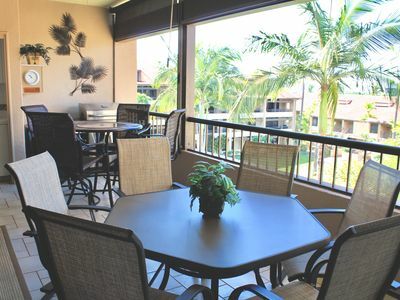 You can sit on your Lanai and look out over the gorgeous Gardens that surround the pool, watch golfers play the 16th fairway of the Royal Ka'anapali Golf Course or off to the horizon you can see people parasailing out in the Ocean. But the best part of the day is sitting back and watching the sunset from your own private lanai. There is a very comfortable swivel chairs/table set plus a BBQ, and a bar with a sink and a refrigerator all located on the lanai. The BBQ is great for the evenings you would like to just stay in, relax and enjoy the views. The kitchen is fully furnished with up scaled appliances. You will love the extras that it has like the silent Bosh dish washer and the filtered water faucet. Our suites are extremely roomy with King size beds and full size bathrooms, which are supplied with fresh linens. Each bedroom also includes a sitting area with TV's that are equipped with cable. One bedroom is on the main floor this room also has a Twin size pull out bed for an extra guest stay. Then the Master bedroom is very private located up stairs with Ocean Views. A new pull out Queen size bed for even more extra guest. This layout is a perfect getaway for two couples. Or for Parents that need a little privacy form their kids. Our Condo is also outfitted with a washer and dryer which gives you the option to pack light. 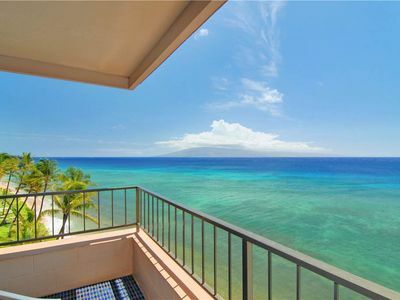 The Kaanapali Royal is a gated community. 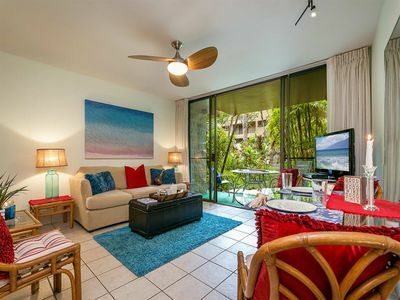 Its amenities include, plentiful parking (allowing you to park directly in front of your condo), two lighted tennis courts, a large pool area which includes a Jacuzzi, shaded lounge chairs, gas B.B.Q., dining furniture and a powered bar for making your favorite drinks. For close by activities guests can play golf at the Royal Kaanapali Golf Course. Call them to reserve your tee time. You can also take walks down to the garden areas or to the 3 mile beach walk. There is also the very popular Whalers Village which is packed full of shopping and restaurants. Another fun activity is Snorkeling/Diving at the Famous Black Rock. And a MUST SEE is watching the torch burning ceremony at Sunset which ends with a breathtaking cliff dive right into the ocean. We love vacationing at our home away from home and we know you will feel the same. * 3rd floor Condo, Parking and Stairs start on 2nd. floor. Only 13 steps to condo OCEAN VIEWS !!! * VRBO REVIEW, see review from when the VRBO Bear stayed as our guests. * We do offer Travel Insurance. What happens if for some reason our condo has maintenance issues where it's not able to be in service? Will I be stranded? Although this has not happen to our guests, NO, you will not be stranded. Our Professional Management has many units in our complex. They will be able to accommodate you with a similar unit. *Easy Process through secured email system. 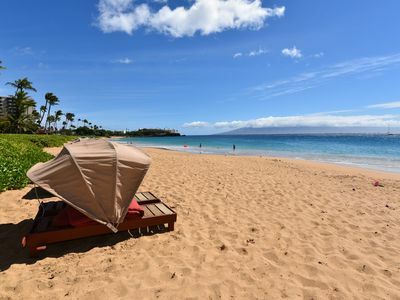 * TRAVEL CHANNEL'S Top 10 BEST PLACE TO STAY IN HAWAII....was voted KAANAPALI for all its beach amenities.... One of the Best Vacation you could possibly have, staying in the Very Popular Resort Area of Kaanapali. 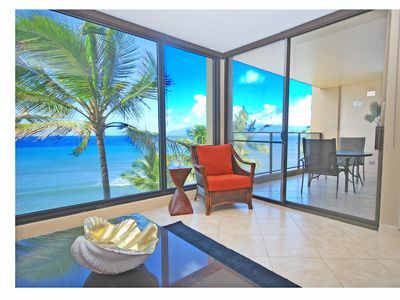 2018: 7 days: 2 bedroom available almost any week at Westin Nanea! $149 per night LAST MINUTE DEALS! MAY 25-31 (6nts) or July 17-20 (3nts) WOW!